Tripsacum dactyloides (L. ) L.
Culms: Erect or bent abruptly below, solid, glabrous, slightly flattened and purplish at bases. Blades: Flat, 12 to 30 inches long, .25 to 1.25 inch wide, glabrous, midrib prominent; margins rough; tips tapered to long points. Sheaths: Open, shorter than internodes, glabrous or sometimes hairy near ligules. Ligules: Rings of short hairs. Inflorescences: Spike-like branches, 1-4, 6 to 10 inches long. Spikelets: Unisexual; staminate spikelets paired, 1/4 to 1/2 inch long; pairs in 2 rows on 1 side of flattened rachis at terminal ends of branches; pistillate spikelets embedded in lower 1/4 of branches, solitary, pear-shaped, 1/4 to 1/2 inch long, hard, bead-like; awns absent. Habitat: Moist prairies, fertile bottomland, and stream banks. Forage Value: It is palatable and very nutritious for livestock. Cattle relish this grass and can eliminate it through overgrazing. Birds and small mammals consume the seeds. Comments: Tufted from thick rhizomes; monoecious (male and female flowers occur at different locations on the same plant). It grows in clumps 1 to 4 feet in diameter. 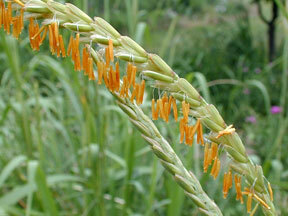 Eastern gamagrass is related to corn (Zea mays L.).